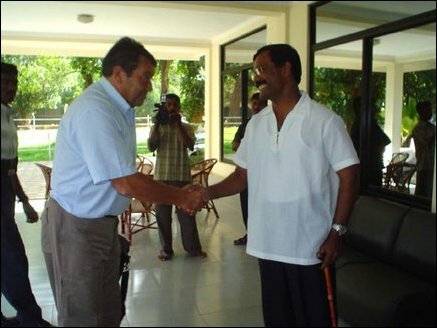 Head of Sri Lanka Monitoring Mission (SLMM), Mr. Hagrup Haukland, met with Head of Liberation Tigers Political Wing, S.P. Thamilchelvan, in Kilinochchi LTTE Peace Secretariat building Thursday at 2.30 p.m., sources in Kilinochchi said. Mr Haukland told the press after the meeting that they had constructive discussions and explored actions to be taken by both sides to maintain peace. Mr Hauland said that situation in the Jaffna and the east has improved according to reports he had received from other members of the SLMM. Responding to a reporter's question, Mr Haukland said that he did not bring any special message from newly elected Sri Lanka's President Mahinda Rajapakse.